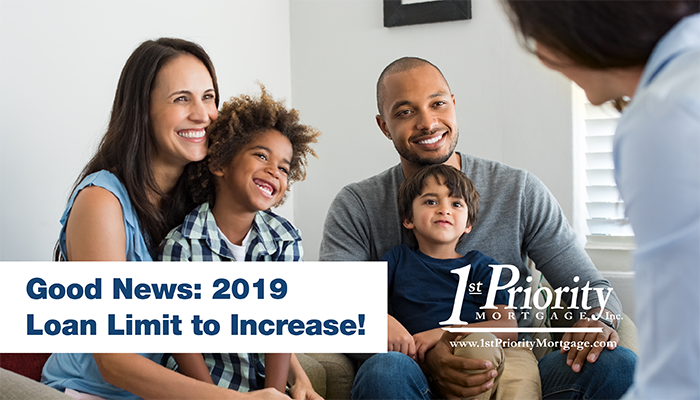 Williamsville, NY (November 29, 2018) – 1st Priority Mortgage, Inc., a Howard Hanna Company, is pleased to announce that we are increasing our single-unit conforming loan limit to $484,350 beginning in January of 2019. Conforming loan limits are set by the Federal Housing Finance Agency (FHFA) each year and establish the limit to which the Federal National Mortgage Association (FNMA) and the Federal Home Loan Mortgage Corporation (FHLMC) can guarantee loans. For comparison purposes, the limit in 2018 was $453,100. The new limit for 2019 will be $484,350. The $31,250 increase is the largest single increase in many years. From 2006 to 2016 the limit remained steady at $417,000 before increasing slightly to $424,100 in 2017. The higher loan limit will offer 1st Priority Mortgage greater flexibility on mortgages up to $484,350 and opens a wider spectrum of possibilities for an increased number of borrowers and their mortgage financing. To learn more, contact a 1st Priority Mortgage Consultant today!